This Full Moon supports focused, life-generating, forward motion in the physical world. In the Heart’s effort to manifest that, this Full Moon supports taking strides to cover gaps between polar opposites that have perplexed people to the point that those opposites are resigned to the realm of the great mysteries. The experience within those mysteries certainly is available to individuals who seek it. Furthermore, following the Heart’s unconventional wisdom brings one to the door of the mysteries where another perspective and sustenance can be found. Tidbit about the Full Moon: When the Moon is full, its position is opposite to the Sun from the position of the Earth. As the two oppose each other, life forms on Earth like the human psyche can feel the tension. The Full Moon tension “illuminates” conflicts that can be addressed in that time frame, to tune the channel even more to receive the voice of the Heart. The New Moon and the Full Moon of previous months have both supported the Heart’s desire for 4 of Disks manifestation. 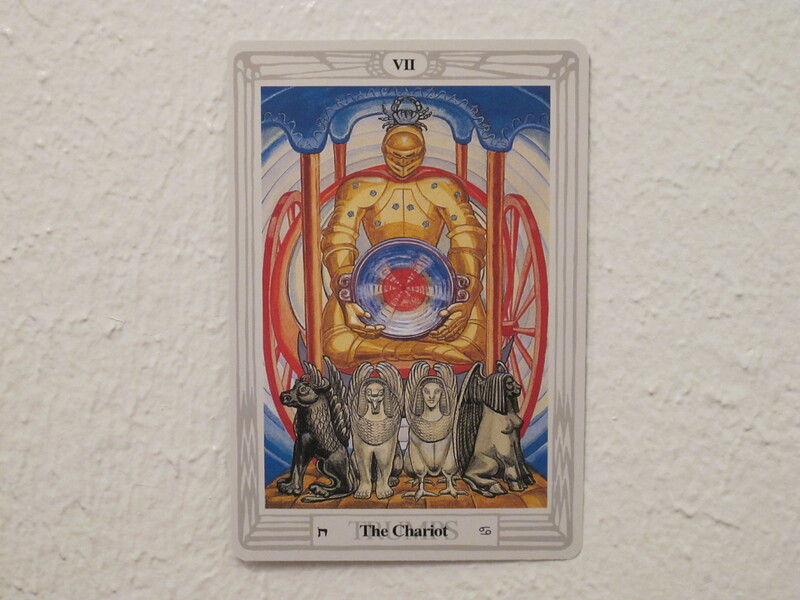 This card’s third recurrence this year shows the Moon’s ongoing support for resurrection of life in the physical world — a miraculous, yet everyday occurrence. From the perspective of the Northern Hemisphere where this deck was created, at the end of winter (the time of Capricorn), the Sun changes its Southward direction and returns to the Northern Hemisphere to resurrect life by nourishing the seeds sown in the land for the next season’s harvest. This is the example that this card, governed by the Sun in Capricorn, offers to inspire the Heart to revisit its goals and dreams and set out in a practical, focused direction (the one single bridge over the moat between land and the castle). This does not mean that the goal and dream should be practical, it just means that one small but practically visible step towards the Heart’s goal should be taken, and when taken, would receive the support of this Full Moon. Indeed, the Heart may have felt many new stirrings since the start of Spring. Since the New Moon of February 18, 2015 also supported the Heart through the 4 of Disks, reflecting back on what new seed the Heart sowed at that time would be helpful in sorting through the creative chaos and finding a step to take. There may have been movement to exit out of an old activity or enter into a new one, since this card is about crossing an important bridge. Since it is now mid-Summer, a sapling would have emerged from the seed by now. Therefore, whatever bridge the Heart crossed in February, this Full Moon returns to that new life to water and nourish it. 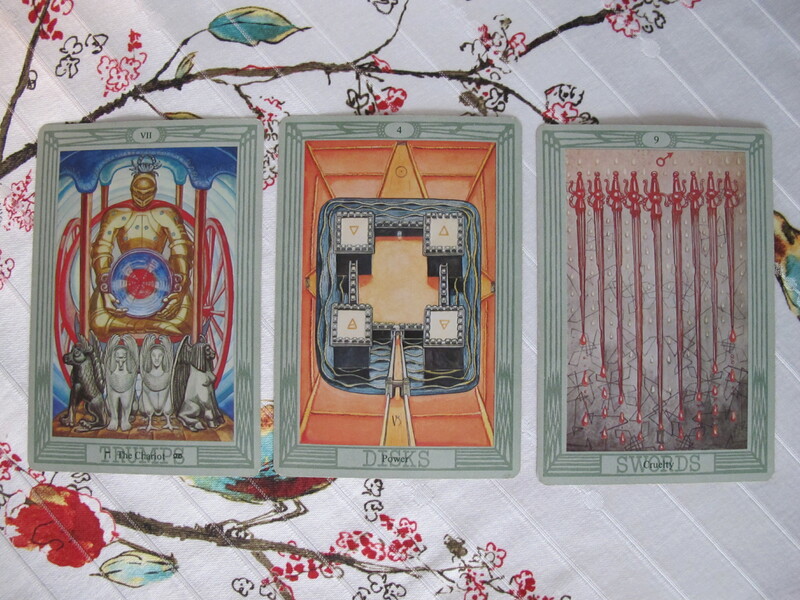 This Full Moon further supports the Heart’s desire to move forward practically through Trump VII and the 9 of Swords. Trump VII affirms the Heart’s ability to accurately interpret the glimpses of the will of the Divine that it has sought and to capture the ecstasy in itself. Particularly, Trump VII affirms that the Heart knows non-duality and non-separateness in a way that 1) has brought about solid self-transformation (chariot wheels rolling on bricks); 2) has been guided by ancient guardians (minor sphinxes drawing the chariot forth); and 3) can be a resource to heal others (holy grail of amethyst holding elixir of Christ’s blood in the figure’s grip). 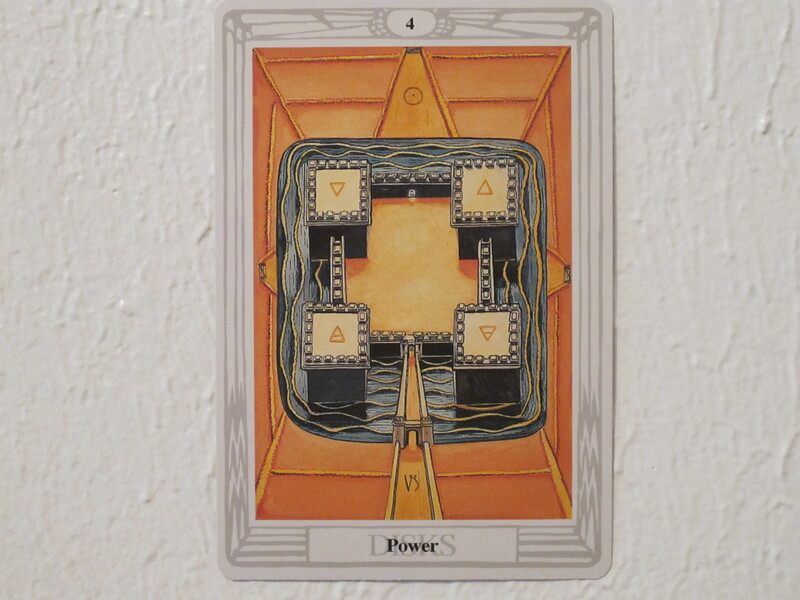 Note: for further research about the card’s many symbols of the masculine and feminine polarities condensing into one entity, Lon Milo DuQuette discusses them succinctly in Understanding Aleister Crowley’s Thoth Tarot, pages 114-116. This Full Moon also supports the Heart by empowering conflict resolution between intuition and intellect related to the 9 of Swords. In studies about the Qabalah in Thoth Tarot, the sephira Yesod (Moon) governs all 9 cards in the minor arcana, and the world of Yetzirah (thought) governs the suit of swords. 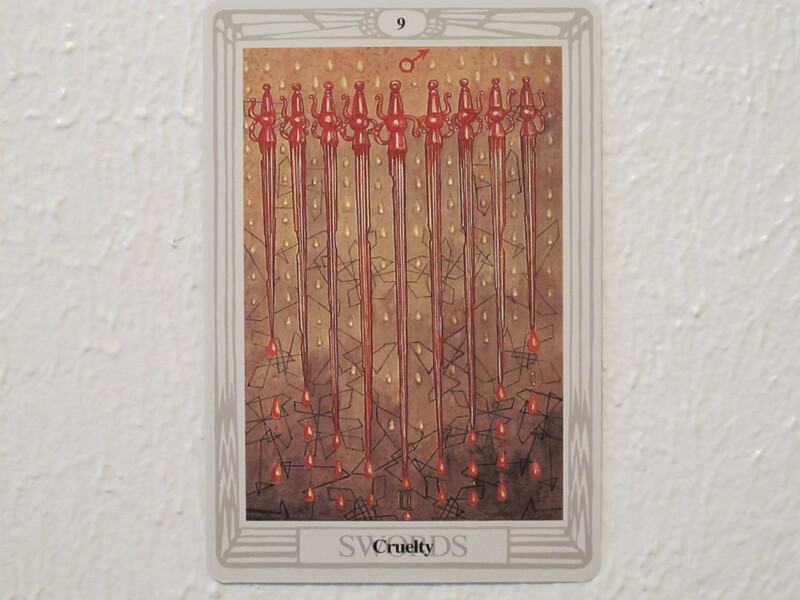 The 9 of Swords is troubled because the intuitive and creative influence of Yesod (Moon) and its symbolic counterpart in the psyche hit an iceberg in the realm of Yetzirah (strong intellect – 9 swords on a scale of 1 to 10). When strong intellect leads the way, it distrusts intuition because it has no experiences in memory that support the intuition’s suggestions. When intuition leads the way, it distrusts the intellect because expressing the Heart’s values may not be a linear, logical task. Therefore, the two ways of knowing clash and the battle in the house of 9 of Swords rages on and on with no winners (swords damaged and dripping blood, and wings washed down from flight by poison rain). The Full Moon is ready to “illuminate” this battle so that the Heart can free up more energy to do the central task of resurrecting life in a practical way. To go forward with the support of the Full Moon: The central longing of the Heart is to take a practical step towards resurrecting new life, If there has been failure, trauma, or resistance before, this resurrection stands on a foundation that also knows divine ecstasy. 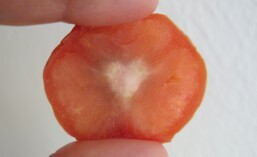 As a point of reference, the Heart may have sown a seed in mid February. That which is already sprouting in fertile soil can be cultivated and grown. Stabilize the Self in loving non-separation from the will of the Divine, and apply the intellect to researching and identifying steps that would enhance the dream. This does not mean to plan how to reach the goal, it just means to plan a useful next step and some related experiences to let the dream unfold. When one step has been taken, then repeat the process to plan the next step. Acknowledge where the intuition and creativity may have battled with the intellect, and ask for forgiveness and illumination during Full Moon rituals. This entry was posted in astrology, charlottesville, full moon, lunar cycle, ritual, spirituality, tarot and tagged astrology, charlottesville, full moon, lunar cycle, ritual, spirituality, Thoth Tarot. Bookmark the permalink.